Want to know what pests are chewing on your woody shrubs? Want to know what is chewing on the pests that are chewing on your woody shrubs? Get WoodyBug (SW 119), a CD-ROM of pest and beneficial arthropods of woody ornamentals for the southeastern United States. WoodyBug includes information on aphids, boring and chewing insects, galls, lace bugs, leafminers, scales, spider mites, thrips and whiteflies as well as many beneficial organisms that feed on these pests. WoodyBug provides information on description, biology, life cycle, damage and management and includes over 150 full-color photographs. The cost is $12, with reseller and quantity discounts available. Runs on both Macs and Windows-PCs. Call the UF/IFAS Extension Bookstore at (800) 226-1764 to order. 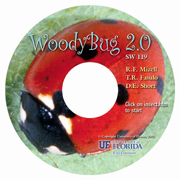 See details on WoodyBug on the Buggy Software Web site at http://entomology.ifas.ufl.edu/fasulo/pests/software/.